The rogue driver who turned a night of fireworks and fun into the worst carnage the French city of Nice has seen in decades appeared aloof and menacing to his neighbours and family, while authorities said Saturday that he had recently turned to religious extremism. The rogue driver who turned a night of fireworks and fun into the worst carnage the French resort city of Nice has seen in decades appeared aloof and menacing to his neighbours and family, while authorities said Saturday that he had recently turned to religious extremism. Islamic State of Iraq and Syria (ISIS) claimed Mohamed Lahouaiej Bouhlel as one of its "soldiers" on Saturday, but what little is known so far about the 31-year-old Tunisian suggests a troubled, unpleasant person who showed little outward interest in Islam. Bouhlel was born in Msaken, a town in Tunisia, but moved to France years ago and was living in the country legally, working as a delivery driver. At one point he married, and later moved to an apartment bloc in the Quartier des Abattoirs — the Slaughterhouse District — on the outskirts of Nice. Neighbours described the father of three as a volatile man, prone to drinking and womanizing, who was in the process of getting a divorce. "I saw him four times a day," said Jasmine Corman, who has lived in Bouhlel's pale yellow apartment building for six months. "He wasn't very nice. ... He was handsome, but his face was miserable." Back in Tunisia, Bouhlel's father said his son was prone to violent episodes during which "he broke everything he found around him." "Each time he had a crisis, we took him to the doctor, who gave him medication," Mohamed Mondher Lahouaiej Bouhlel told BFM television, even showing journalists what he said was a document about his son's psychiatric treatment. People gathered near flowers and candles left in tribute to victims after Thursday's deadly truck attack in Nice, France, which left at least 84 dead. Bouhlel said his son hadn't visited Tunisia in four years and hadn't stayed in contact with his family. 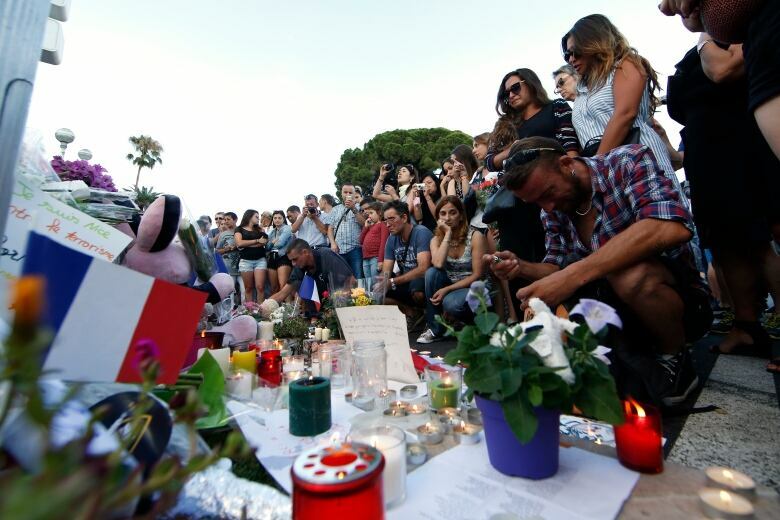 "What I know is that he didn't pray, he didn't go to the mosque, he had no ties to religion," said the father, noting that Bouhlel didn't respect the Islamic fasting rituals during the month of Ramadan — an account seconded by neighbours in Nice. Bouhlel had had a series of run-ins with the law in France for threatening behaviour, violence and theft over the past six years. In March, he was given a six-month suspended sentence by a Nice court for a road-rage incident in which he attacked another driver with a wooden pallet. His court-appointed lawyer, Corentin Delobel, said he observed "no radicalization whatsoever" of Bouhlel. And Paris prosecutor Francois Molins said Bouhlel was never placed on a watch list for radicals. Bouhlel was shot dead by police in Thursday's attack. French police arrested three people on Saturday, in addition to two others they had arrested on Friday, including the attacker's wife. Police sources said the arrests concerned Bouhlel's "close entourage," Reuters reported. After ISIS claimed Bouhlel as one of their own, French Interior Minister Bernard Cazeneuve told reporters it seemed he had been "radicalized very quickly," citing information from the five people taken into custody. The chronology of Bouhlel's last night is still being pieced together. 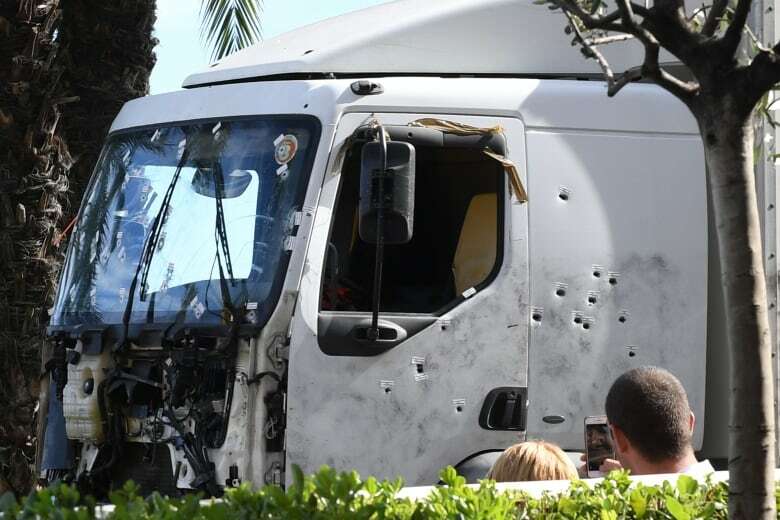 Records show the 19-tonne truck that he rammed through the seaside crowd in Nice was rented in the outskirts of the city on July 11 and was overdue on Thursday, the night of the attack. The truck used in the attack is towed away by a breakdown lorry in the French Riviera city of Nice. About 25 minutes before the July 14 fireworks show — which commemorated Bastille Day, France's national holiday — Bouhlel drove toward the city centre. Shortly after 10:30 p.m., he reached the Promenade des Anglais, driving up on the sidewalk to avoid the police cars blocking the road. He then took aim at the thousands who had gathered to watch the fireworks show, killing at least 84 people and wounding over 200. Witnesses described seeing Bouhlel purposely steer the truck to hit families as they tried to flee. "It was such a nice atmosphere before this started," recalled Sanchia Lambert, a tourist from Sweden who had come to visit family in Nice. "There were people playing drums, kids riding their bikes. That makes what happened all the worse." Her husband, John Lambert, said the couple was almost struck by Bouhlel's truck. "I saw his face," Lambert told The Associated Press. "He was totally focused." France began three days of national mourning on Saturday. Attack in Nice: why is France targeted?